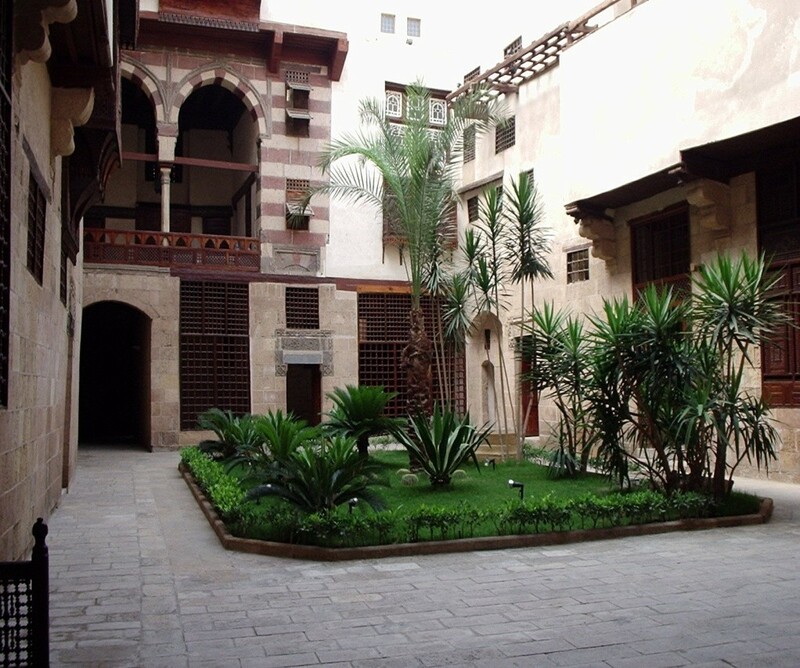 Al-Suhaymi Mamluki house in Cairo, Egypt. Islam as a comprehensive way of life influenced the planning and designing of the houses of its adherents. Not only that, Islam also laid a solid foundation, in some instances in form of laws, for creating what came to be known as the phenomenon of Islamic housing. The Holy Qur’an furnishes Muslims with a comprehensive conceptual framework for housing. This framework has been first applied, explained and further enriched by Prophet Muhammad (pbuh). While developing the city of Madinah, upon his and his followers’ migration (hijrah) from Makkah, the Prophet (pbuh) under the aegis of revelation provided scores of lessons in Islamic housing. Since Muhammad (pbuh) was the last Messenger of Allah to mankind, such lessons are to be held by Muslims as both universal and everlasting. They stand for an important segment of the Prophet’s sunnah which each and every Muslim is required to follow as much as life conditions permit. In Islam, the house is a place to rest, relax the body and mind, and enjoy legitimate worldly delights. Within the realm of their houses, Muslims also worship, teach, learn and propagate the message of Islam. Central to the standards by which a house may be categorized as “Islamic” are the holiness and purity of its philosophy, vision, function and utility, accompanied by convenience, efficiency, safety, awareness of the physical surroundings, and anything else that Islam reckons as indispensable for living a decent and accountable family life. The sheer physical and artistic appearance is therefore inferior and matters only when it comes into complete conformity with the above mentioned criteria. Muslim architects, planners, structural engineers and final users alike, should perceive the house phenomenon as a sheer means, an instrument, a carrier of the spiritual, not a goal itself. Islamic housing is a blend of the belief system, teachings and values of Islam, on the one hand, and the prerequisites and influences of indigenous cultures, climates, topographies, the availability and quality of building materials, talents, technologies and economies, on the other. The house institution occupies an extraordinary place in Islam. It is a family development center. It is a microcosm of Islamic culture and civilization, in that individuals and families bred and nurtured therein constitute the fundamental units of the Islamic ummah (community). The places where people live are the first and arguably most critical educational and development centers. If they function properly, such centers have a potential to produce, in concert with other societal establishments and centers, the individuals who will be capable of transforming and making better their immediate surroundings and the whole communities they belong to. Conversely, if misconstrued and their roles distorted, the places where people live have a potential to become a breeding ground for a range of social ills, which if left unchecked could paralyze entire communities and stifle their civilizational undertakings. It follows that in Islamic society there ought to exist a high level of ideological compatibility between the house and other societal institutions. An ideological incompatibility, or dichotomy, between the two poles is unacceptable and can only hinder, if not thwart altogether, the progress of society. Indeed, it is very difficult to live delightfully, honoring and applying the teachings and values of Islam in a residential architectural world that is alien to the same teachings and values and their divine philosophy. It is only when compatibility between the two ambits exists that people’s actual interests and welfare will be ensured, and that residential planning and architecture will become more than just a routine external process of planning, designing and erecting houses. Without a doubt, there is much more to Islamic housing than just that, that is, than the conventional physical aspect of the whole thing.